Long renowned for promoting a good night’s sleep, Molecular Medicine Reports notes: “Chamomile is widely regarded as a mild tranquilizer and sleep-inducer. Sedative effects may be due to the flavonoid, apigenin that binds to benzodiazepine receptors in the brain”. A hot cup of chamomile tea is best enjoyed around 30 minutes before bedtime, to make the most of its shut-eye boosting benefits. Need a hot, milky drink before bed? The lactose found it cow’s milk can trigger congestion and phlegm production, raising the chances of snoring in people with lactose intolerance. Unfortunately, many dairy products have the same result, bye bye night time chocolate snacking! Opt for almond milk to avoid the problem. Other rice, oat and soy milk will do if almond milk is not to your taste. Cocoa optional! Enjoying a tasty fish supper of salmon, trout or mackerel in the evening will not only be delicious gilled or roasted, can ease inflammation throughout the body. Inflammation can cause nasal passages to close, making snoring an inevitability. According to thehealthline.com, the benefits of fish oil for heart health include: Lowering cholesterol levels and triglycerides, reducing blood pressure and eliminating plaques. Onions are natural decongestants and are also packed with anti-oxidants. Strong, aromatic foods like onion including garlic and horseradish can help prevent snoring by drying out your nose, reducing congestion. Some claim that these foods also reduce swelling in your tonsils, preventing sleep apnoea. Onions can also add a hot, sweet and sharp crunch to your favourite summer salad. 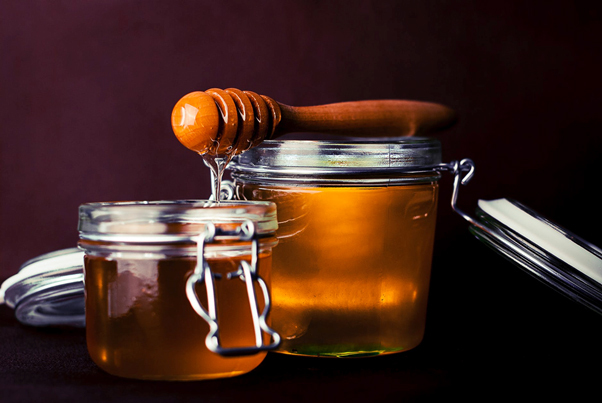 Honey relaxes and soothes the throat, and also reduces swelling which is why it’s been used for common cough and cold treatments for centuries – why not stir a spoonful in your chamomile tea or dairy-free milky drink before bed to beat snoring.